[01:26]And I shaw it thru without exemption. [02:52]y si lloré, también reí. [03:04]And did it my way. [03:51]And may I say, not in a shy way. [04:11]Yes Julio, it was our way. 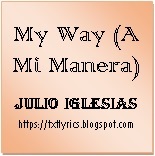 Source: Manual transcribed, Lyricwiki, chartlyrics, lololyrics, azlyrics, google.